We love hearing from our guests, good and bad it all makes us better! See what others have to say about their experience with Russell Vacation Rentals and book your property today! We loved staying here! It is in a perfect location, very easy walk to the beach, and was the perfect space for 4 adults to stay. Would definitely recommend! Our stay in your condo was amazing. The condo looked just like the pictures. The views were amazing. I've already had two people to ask about where were staying during our trip and of course I gave them your information. My family and I will definitely be back and I'll definitely look up Russels Vacation Rentals. Hurricane Michael really destroyed our community in October and our homes were heavily damaged. Having a beautiful sanctuary to come to and enjoy was truly a saving grace. This home is beautiful and the property managers answered all questions and needs promptly! Lovely space, great location, excellent communication with Russell Vacation Rentals. I had the best experience from the moment I spoke to Maria to book unit 1606 until the sad moment we shut the door to leave! All the folks at Russell Vacation were phenomenal. I cannot say enough wonderful things about unit 1606. Often when looking at pictures the actual condo may not look exactly as good as photographed. Not the case with 1606. It is even more beautiful in person. Attention to detail second to none from the lovely balcony furniture to the well stocked kitchen. Nothing but perfection! Kudos to both the owner and the rental agency for a job well done! Nice unit in a great location. Very clean unit with nice amenities. Short walk to a large community pool. Private access walk to the beach. Boogie boards, cooler, etc to take to the beach. Host was very prompt in responding to any questions. Easy check and check out. Highly recommend this unit! We enjoyed an amazing week with the family this cottage. Walking distance to beach and grilling out front of the porch. Very comfortable and clean and the Russel Vacation staff was always available when we had any questions. We will be back! This was our first family vacation and this townhouse fit our family perfectly! Very clean and nicely decorated. Had all the needs of a home away from home. Beautiful ocean views, short walk to the beach. Management was excellent! If we go to Miramar beach with our family again, we would definitely try to stay here. This was the perfect home for our girls weekend. The moment the guests walked in the door, they were so amazed at how nice it was. They kept looking around at every detail of the house. The neighborhood was charming and sweet which we loved. The location was perfect, far enough away from traffic, but a short drive to any beach. Not walkable, but that was fine with us. The management company was so easy to work with and super accommodating. If youre on the fence about this property, go for it! It was one of the best decisions we made regarding our trip. I was greatly pleased with the service provided by Russell Vacation Rentals. Will look forward to renting at your properties in the future. Great services and quick responses. Property was well maintained and definitely recommend to anyone. My family stayed here for 6 days for our summer vacation. The condo/house was everything we wanted plus more. Great space so we never felt crowded. Easy access to pool. Golf cart was great for accessing all baytowne has to offer including the beach. Would recommend this to anyone! Nine slept very comfortably! Awesome rental, great management! Lovely condo with an amazing view! I was so pleased to find that the condo looked EXACTLY like the photos! That doesnt always happen :-) the deck is huge and a great spot to relax and watch the ocean. The condo itself has a nice, spacious lay out. Loved the washer and dryer in the unit so we could wash our beach towels every day. Beds were also comfy. The team was always very responsive to questions. Looking forward to being a repeat customer! My husband and I stayed in this condo for our honeymoon. On arrival the room was very clean, new appliances, anything you would need in the kitchen, extra blankets and sheets if needed. Amazing view to the beach, it took us around 5 minutes to walk to the beach and thats including the 18 flight ride down the elevator. It was very peaceful, no loud noise. Trash chute as soon as you walk out of the door. No card to keep up with to get into the room, just have to remember a code. The swimming pools were very nice and clean as well. We plan on coming back next year! We had a wonderful time at Sandestin. The condo did not disappoint, it was perfect for our family of four. The location is great and the golf cart was a very nice amenity. We took it on the 5 minute drive to the beach daily and on the 3 minute drive to dinner/events at Baytowne each evening. Interaction with Russell Vacation was minimal. They e-mailed when they said they would and responded very quickly each time. Great experience with them. Overall, we had a wonderful vacation here and would recommend it to all. Beautiful unit, with a fantastic view. The unit was very clean, and the rental company, Russell Vacations was excellent. We really enjoyed the golf cart and would absolutely stay in the unit again. We are a retired couple from the Midwest who spent March, 2018 biking, walking the beach and playing golf in the mild spring weather of the Florida panhandle. 727 is a fully equipped, open concept house located directly on Sandestins very well maintained Links Golf Course. Its eastern exposure and colorful decor provide both bright and cheerful accommodations. Located on a quiet street, we met several friendly neighbors, both renters and owners. Any questions we had were addressed immediately by Maria and John at our rental agency, Russell Vacations. A minor issue with the gas grill was corrected by David within an hour! We really enjoyed our month, have already re-booked and are looking forward to visiting again next year! Thank you for your assistance with our trip and for accommodating us and our needs and requests. Everything was perfect from booking to check out. This condo was perfect from ease of booking to check out. The photos are exactly as the condo looked inside and outside. Beautiful views of the bay, boats and right on the golf course. This condo is beautifully decorated with nice and comfortable furnishings and is in a secure, quiet and great location. We would definitely stay here again! There is everything you may need or want in this resort location! We absolutely LOVED our stay and customer service with Russell Vacation Rentals. Cindy was amazing and extraordinarily quick in responding to any questions or needs. So much better than a hotel room. We felt so much more peaceful and calm and loved the extra space to spread out. We felt at home! Thank you so much. It was so enjoyable! This house was perfectly clean and looked so nice from the time we walked in. It had everything we needed, and we felt totally at home! Even though it was just the 2 of us, we discovered it was SO MUCH BETTER than a small hotel room. We had more space to spread out and other bathrooms when needed. We truly enjoyed our stay and felt so much more relaxed and rested because of the privacy and space and quiet neighborhood! The pool was close by and nice to use after the beach. The difference in renting a house versus a hotel room was extremely noticeable, and we loved every minute of it. Russell Vacation Rents was top notch and responded immediately when we had a question. We were so pleased and impressed! We will be back! We choose this property for our Spring break trip. We arrived after check-in in time which was 4pm. Upon arrival we our code that was issued to enter the property worked as stated. We entered the property and it was SUPER clean! All of the furniture was in condition and there was lots of useful things like a Kuerig,full set of utensils, pots & pans, soap for the dishwasher, bbq grill, plates, knives & forks etc. The only thing you need to bring would be your personal things like hygiene products and food. We would definitely stay at this property again! The only thing we recommend for the property is a golf cart it would make it so much easier getting around the resort which is pretty big, otherwise the staff and property are excellent! We made a mistake and left a two things in the room and they text us with us pictures and let us know how we could get them back which was awesome and great customer service! From check-in to departure, everything was perfect. The owners sure didn't miss a thing here. The condo was clean, comfortable and well stocked with everything needed for our stay. We found the view from the balcony to be so peaceful during the day, and beautiful at night with stunning views of Horseshoe Bayou. The included golf cart was a HUGE plus as well. One can access the grocery store, restaurants, the outdoor mall and, of course, the beautiful beach...all by golf cart! The resort is gorgeous and has so much to offer. Baytown Wharf has shopping, restaurants, fun and exciting nightlife, and plenty for the kids to do as well (bike rentals, zip-lining, etc). Be sure to take the golf cart over to Baytowne Marina and say "hello" to Mary Ann the Macaw. She'll say "hello" right back! Our stay was so enjoyable and the condo was so comfortable that we've already booked a return visit! My husband and our two 14 year old sons all really enjoyed this rental and the location. The condo was perfect for us. The decor was great, it was very clean and everything we wanted to do was within easy walking/biking distance. The boys loved going down to grab donuts in the morning and we all appreciated the convenience of the restaurants, pubs and shops and we loved listening to the live music every night. We were also able to rent bikes downstairs and we enjoyed the jacuzzi that was just a few flights down. We didn't get in our car for three days, which was exactly the kind of vacation we were hoping for. Thank you! 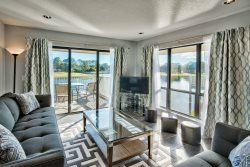 Our February 2018 stay at the Ariel Dunes 1 property, Unit 1803 was better than expected. The accommodations were superb. The cleanliness of the condo and the furnishings were again superb. We enjoyed the heated pool and even took a Florida tan back to chilly Ohio when we left. The balcony view was amazing both day and night. I just wanted to Thank you for the privilege of letting us stay at your condo and also to Thank Russell Vacation Rentals for all of their help. Five stars to both the condo and the rental company. I have used Russel Vacation Rentals a few times in this area and have always had an amazing experience with them. The home is great, clean, and modern, with an amazing view of the bay on a golf course. I cant wait to go back!